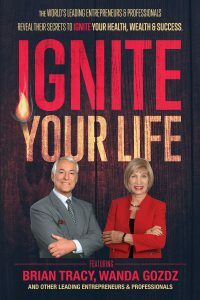 Orlando, FL – June 9, 2016 – Wanda Gozdz, founder and president of Golden Age Living, LLC, recently joined a select group of business experts and entrepreneurs from around the world, along with success expert Brian Tracy to co-write the book Ignite Your Life: The World’s Leading Entrepreneurs and Professionals Reveal Their Secrets to Ignite Your Health, Wealth and Success released on May 19th, 2016 by leading business book publisher, CelebrityPress®. So you wish to escape the humdrum and enjoy higher visibility, success and status in your field. You have noted that many are trapped in a vicious cycle of life and mindset, making no real progress. However, you wish to be different. Fire is synonymous with heat and light, so the phrase Ignite Your Life connects your desire to move from darkness and anonymity to becoming recognizable and significant. It is this state that the PremierExperts® in this book have attained. They have achieved different levels of visibility and success in their chosen fields. As you read this book, you will note that they all come from diverse and unique backgrounds, confirming that success is not set aside for any particular individual or group and is not limited to any particular subject. The PremierExperts® in this book cover a variety of topics, but for each author there is a commonality of mindset that promotes success. They utilize knowledge, goal setting, perseverance, passion and action to move them to their desired goal. The information they have shared here – including guidance on ‘how to’ as well as ‘how NOT to’ – makes their stories invaluable to all who wish to learn the secrets to successful achievement. Click HERE to order a copy of Ignite Your Life. A portion of the royalties earned from Ignite Your Life will be given to Entrepreneur’s International Foundation, a not for profit organization dedicated to creating unique launch campaigns to raise money and awareness for charitable causes. After such a successful release, The National Academy of Best-Selling Authors™, an organization that honors authors from many of the leading independent best seller lists, will recognize Gozdz for her contribution. Wanda began her career as a teacher and moved into the business world to become a purchasing agent. She left after seven years and learned to manage library resources, which provided the foundation for starting W. Gozdz Enterprises, Inc. in Florida. Wanda Gozdz joined the National Association of Women Business Owners (NAWBO), while continuing to market to Big Six accounting firms, law firms and law libraries. She served on NAWBO’s National Public Policy Council, which helped pass legislation-supporting women business owners. Gozdz was award the 1995 Public Policy Advocate of the Year award from NAWBO and that same year she was also named Small Business Woman of the Year. Because of her determination to stay in her own home “forever,” her mother inspired Gozdz to move into the Aging in Place arena. Gozdz pursued a degree in Interior Design and became a Certified Aging in Place Specialist (CAPS). Today, she is an instructor for the National Association of Home Builders (NAHB), which named her the 2014 CAPS Educator of the Year. In addition, Wanda teaches CAPS and Universal Design nationwide and internationally and speaks on the topic of “Aging in Place” at international conferences. Wanda Gozdz authored Sensible Smart Tips for Living in Your ForeverHome™. Karen Kane of Karen Kane Interiors and Gozdz received the 2013 Laurel Award for Residential Construction less than 10,000 feet from the Green Building & Remodelers Council of The Treasure Coast Builders Association (TCBA) for their design work for the Lobby Project at Hibiscus by the Sea. She also received the Golden Mouse Award for Digital Devices from Women in Ecommerce for creating an encrypted flash drive for storage of confidential information. Wanda has served on the Florida Board of Architecture and Interior Design and on the Advisory Committee of Indian River State College, Interior Design & Technology Department. She is a member of the American Society of Interior Design (ASID), Interior Design Society (IDS), International Furnishings & Design Association (IFDA), National Kitchen and Bath (NKBA), Association of Aging in America (AIA), and Builders Association of South Florida (BASF). She is an avid runner, finishing first in her age group in the 2015 Fort Lauderdale Marathon. Celebrity Press® is a leading business, health and wellness book publisher that publishes books from thought leaders around the world. Celebrity Press® has published books alongside Jack Canfield, Brian Tracy, Dan Kennedy, Dr. Ivan Misner, Robert Allen and many of the biggest experts across diverse fields. CelebrityPress® has helped launch over 1800 best-selling authors to date.